MechCaL was recognised with top honours at the Mining Ventilation Society of South Africa (MVSSA) awards ceremony in recognition of their contributions to industry knowledge and research. 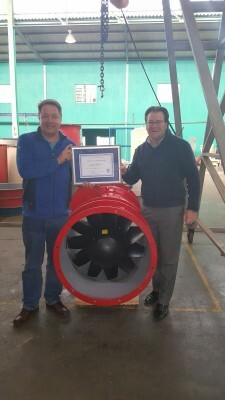 Principle Engineers Michael Minges and Michael Schildhauer received the Society prize for Best Paper of the Year for their paper titled “Development of an Efficient Axial Flow Fan” – which was published in the Q4, Volume 68 of the MVSSA journal in 2015. Their paper examines the development of an efficient axial flow fan and describes the selection of the fan performance criteria in terms of static pressure versus flow rate. A brief overview is given of the aerodynamic procedure and some CFD results are presented. Mechanical design issues are also described in the paper, including stress analysis on the rotor as well as designs to improve the vibration levels of the rotor. Finally, experimental test results are compared to CFD predictions and the targeted duty curve. What their research found was that fan efficiency peaked at 80%. The Mine Ventilation Society of South Africa has, for more than seven decades, provided a forum for mine ventilation professionals to share and improve knowledge and research into issues of mine ventilation. The Society publishes textbooks and training material, is involved with national and international conferences in the field, and publishes a regular Journal. Many members of the MVSSA, both past and present, are considered to be global experts in the field of mine ventilation. 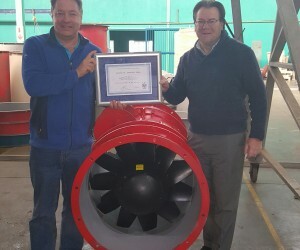 “A number of MVSSA members have been involved with MechCal’s efforts at improving auxiliary fan performance over the years, and as custodians of ventilation-related energy consumption as well as workers’ exposure to noise, we commend the authors and MechCal on this useful and timely contribution, and congratulate them on their excellent paper,” said Roman.